This morning (Monday—yes, still behind), I completed my final observation at another school in El Porvenir. It was definitely an interesting experience because the school I observed is a Catholic school (considered more private than the others), as opposed to a national school (or public school, which is what every other school I’ve observed so far is considered). Since students from the secondary school were on a field trip to local historic sites for the day, I was only able to observe students in primary school. Upon speaking with a local social worker, I was informed that there is a lot of crime among the students, including extortion and theft. When I spoke to the director of the school, she mentioned that a lot of the children have difficulties at home that influence their behaviors, including lack of parental support and/or parents having to work long hours, leaving their children unsupervised upon returning from school. This recurring theme seemingly continues to make its way into every school that I observe. There are so many challenges that these children face both inside and outside of school, but especially once they leave school grounds each day. The risk factors are substantial, and we have to focus on fostering more protective factors in order to provide these children with substantial support so they can have the futures they deserve. In the afternoon, we had our weekly meeting with a group of local women and family members in El Porvenir that I briefly discussed last week. Each week, two students from the program are responsible for teaching the group members relaxation and emotional regulation techniques for them to utilize at any given moment and teach others in their community. This week, one of the other students and I were in charge of working with the group members’ children—some of whom have physical disabilities and/or difficulties with motor skills and/or verbal communication deficits. We had each child write their names and draw something that corresponds with each letter of their name. The creativity and abilities in these children are truly incredible. 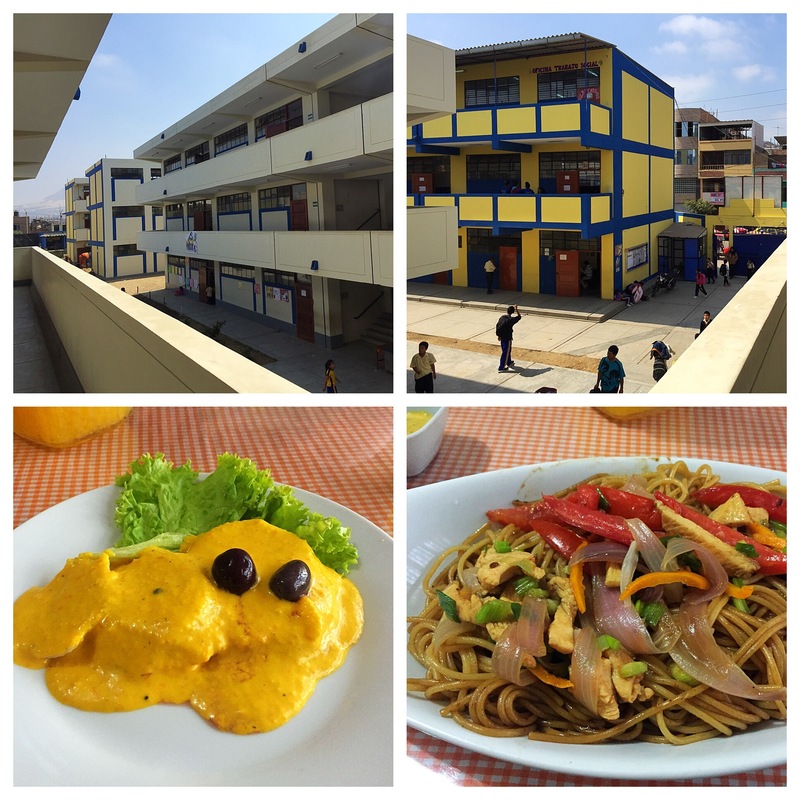 After our group, we went back to Trujillo for our Psicología en Peru course. Tonight, we focused on statistics within the country, all of Latin America, as well as throughout the world. When we look at a global scale, depression happens to be the most common mental illness. However, in Latin America, only five percent of the adult population reportedly suffer from Depression. According to the NIH, “In 2015, an estimated 16.1 million adults aged 18 or older in the United States had at least one major depressive episode in the past year.” If so many people in the United States alone have experienced depression, why is the percentage so low in Latin America? It’s because so many people do not seek or receive mental health services. This number is merely what is reported. Among so many other challenges, stigma is the biggest problem pertaining to bringing attention to mental illness in Latin America, and especially Peru due to discrimination against mental health. If you seek any type of help or treatment, you’re considered “weak” or “crazy.” You’ll likely be asked, “Are you weak? You’re not strong enough to deal with this?” Alongside stigma, shame and misconceptions about having a mental illness come into play as well. Even if we were to put stigma aside, psychoeducation is another challenge. If someone does in fact have a mental illness, many times, they’ll go to the local clinic with the belief that it’s a physical illness as opposed to a mental illness. In a perfect world, hypothetically speaking, of course, let’s say that someone does in fact go to the hospital for an issue pertaining to their mental health. As I mentioned the other week, you would have to wait days in the hospital before getting an appointment, and when you finally do get one, your appointment would only last a few minutes, and would consist of being asked a few “yes” or “no” questions to determine if you have depression. There isn’t enough time to converse with the patient, so the odds of someone actually getting the help he or she needs and deserves are slim to none. But first, you’d have to overcome the stigma and shame in order to even make it to this point. And you’d have to hope that your family wouldn’t abandon you due to shame as well. Now if you want to talk about services, there is about 1 psychiatrist per every 300,000 people in Peru. If we were to look at another country, let’s say Colombia for example, there, you would find 2.1 psychiatrists per ever 10,000 people. Pretty significant difference, right? This is why education is so important. We must spread the word about mental health because until we can do so, millions of people will not receive the necessary services they require. Today happened to be one of the calmer days in my schedule, so I’ll keep today’s post short, so as not to bore any reader more than usual. Today’s class focused on Spanish grammar, which I’m still trying to wrap my head around, so I’ll save that for another day. If we don’t look out and care for ourselves, how can we expect to do so for others? If we are continuously running on empty each and every day, how can we realistically expect to give the most of ourselves to those around us? Think about it this way. If your child, parent, grandparent, significant other, or close friend spoke about feeling overwhelmed and stressed out, what would likely be your initial response? Probably something along the lines of, “You need to take some time for yourself to relax and do the things that you enjoy.” Tell me this. Why is this any different for us? Why is it that more often than not, we are able to be a helping hand to those around us who are experiencing difficulties, yet we can’t find the means to give ourselves the same level of care and support? Granted, just about everything in life is easier said than done, but it’s truly interesting if we really take the time to think about it. If we can give such great advice to those around us, why can’t we do the same for ourselves? You’ll have to excuse the fact that this post is seemingly all over the place, but after testing out this new gym (which includes a personal trainer everyday), I feel sore in places I didn’t even know exist. Maybe that will explain the lack of organization and cohesiveness in today’s post, but there is a message (or at least I think there is). Think about advice you would give to a loved one. We each deserve that same level of care, support, and love in our lives as well. And somewhere along the way, it has to start with self-care and treating ourselves as well as we would tell loved ones to treat themselves. We need to make time for ourselves so that we don’t run on empty. Because as harsh as it may seem, no matter how hard we may try, we can’t be of any help to anyone else if we don’t help ourselves first. 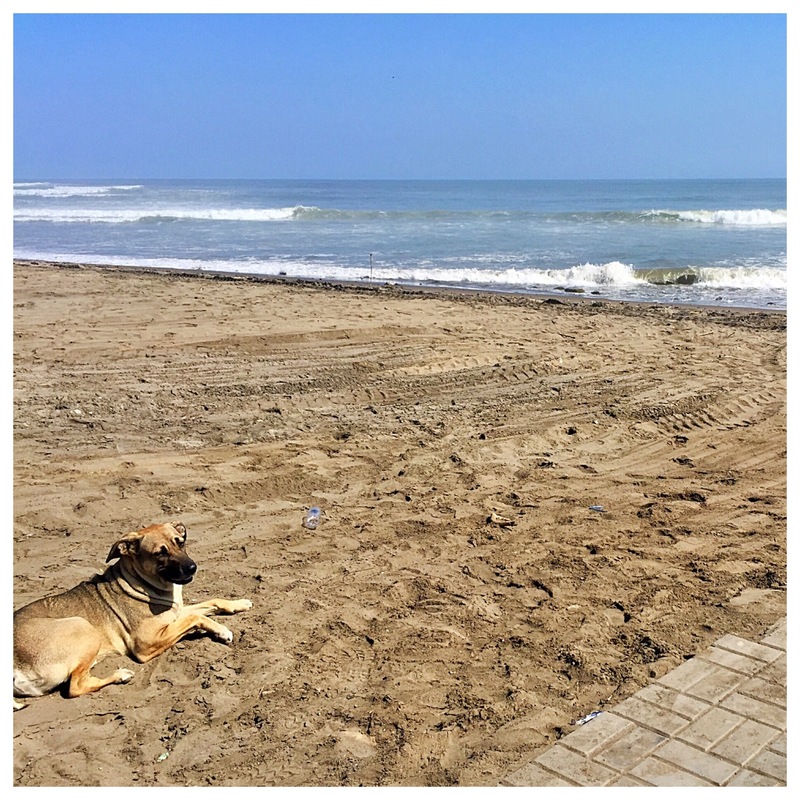 And with that, I’ll leave you with a picture of a dog sunbathing by the beach because even he knows the importance of self-care. I was able to spend the morning with family friends from the city, as we shared breakfast together in Moraflores, overlooking a beautiful city and ocean view (top left photo). 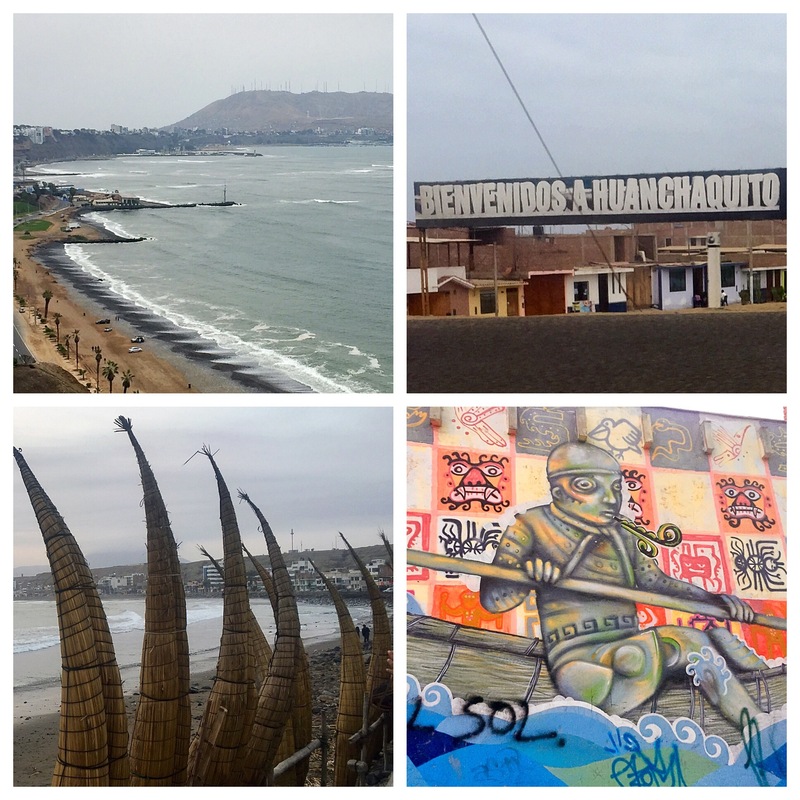 Since it is wintertime in Peru, the sun doesn’t shine as often in Lima, which explains the cold, overcast weather. My flight to Trujillo was scheduled for the early afternoon, so shortly after breakfast, I had to head over to the airport to make it to my final destination. The owner of the house we are staying in picked me and the other students up from the airport, and drove us to Huanchaco, which was a 15 minute drive, at most. The other students (from across the country) and I had dinner at a restaurant called “My Friend,” which offers a variety of Peruvian dishes, as well as hamburgers and pizza for visiting Gringos. I ordered pollo a la plancha con arroz y papas (grilled chicken with rice and French fries) for only 16 soles (around five dollars). The cost for food in the area is pretty inexpensive, so here’s hoping I eat well before any Amazon/Whole Food buyouts and mergers make their way over here. Tomorrow starts our first class with a local psychologist in Trujillo- Psicología en Peru. Until then, hasta pronto!